Tony Scott, an action icon and director of such (non-Denzel) films as Top Gun, Days of Thunder, True Romance, and Enemy of the State, took his own life on Sunday night. In honor of him, his long-time collaboration with Washington, and due to the fact that a full Rundown of his highlights would take an hour to read, here's a rundown of the great action collaboration of Tony Scott and Denzel Washington. I should say first of all that I love Tony Scott's movies. His hyper-kinetic visual style, long lambasted by critics, has never bothered me (in the same way, I never felt sick watching The Blair Witch Project) and I was often exhilarated by it. Of course, Crimson Tide doesn't really feature any of that, just crackerjack action and performances by Gene Hackman, Viggo Mortensen, and, of course, Denzel Washington. Having just come off of Malcolm X and Philadelphia, Crimson Tide allowed Denzel a chance to have some fun. He must have liked it, because he would team up with Scott four more times before Scott's untimely death. Crimson Tide may stretch credulity (my father, familiar with Naval protocol, can't stand it) but it's taut, exciting, and superbly acted. 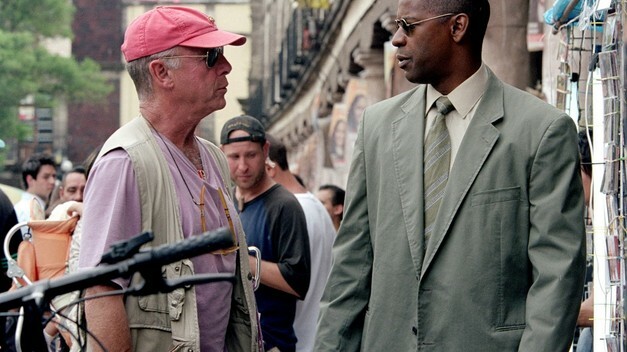 Man on Fire is probably my favorite modern Tony Scott picture. Top Gun and Days of Thunder are beloved, to be sure, but are, in a sense, relics of my childhood more than they are favorite films of my adult life. The simple story of a down-and-out military man (Washington) hired to protect the daughter (Dakota Fanning) of a wealthy family living in Mexico City, Man on Fire is nonetheless a tour de force. It hits all the standard revenge plot beats, and even uses (to great effect) the hoariest of hoary cliches (the wide-eyed moppet breaking down the grizzled heart of stone), but is without question a moving story (at times, to tears). Alternating jarringly between tenderness and violence, Man on Fire is the story of a man with nothing to lose, and is not to be missed. 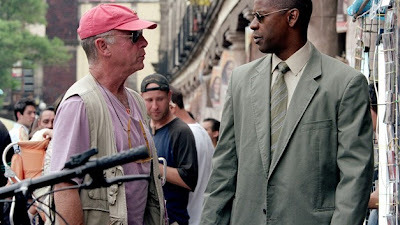 In his director's commentary track for Deja Vu, Tony Scott describes what prompted him to sign on to direct. In one of the films early scenes an ATF agent (Washington) attends the autopsy of a woman (Paula Patton) pulled out of a New Orleans river after a terrorist's bomb has destroyed a barge. Seeing her beauty, even in death, he is moved. Scott said that he wanted to try to tell a love story in which the girl-meets-boy didn't happen until after the girl was dead. Talk about the opposite of a meet-cute! A techie's dream, Deja Vu involves cool gadgets, potential time travel, and, of course, the retroactive foiling of the bad guy (Jesus Christ himself, Jim Caviezel). Deja Vu is let down by some of the supporting performances (Matt Craven, Caviezel, and Patton fall a little short but Val Kilmer and Adam Goldberg do well) but is an enjoyable romp. Perhaps Scott's most critically panned film, The Taking of Pelham 123 is a remake of an excellent 1974 film (of the same name) with Walter Matthau and Robert Shaw. Critics, it seemed, were just too in love with the original movie to view Scott's Pelham on its own merits. I don't claim that it's a "necessary" remake (in fact, I can't think of a remake that is), but Pelham is another fun Scott/Washington ride. A terrorist (John Travolta) and his team of heavies (played by real Albanian ex-criminals) have taken a New York subway car hostage. On the case are an MTA dispatcher (Washington), an FBI hostage negotiator (John Turturro), and the mayor of New York (James Gandolfini). There's a bit of unnecessary business attempting to turn Washington into a flawed hero, but it's needed (in a sense) to get the runtime to feature length. That's how tight a thriller this is. In his obituary for Scott, the AV Club's Scott Tobias had this to say about Unstoppable: "Unstoppable was as good as anything he ever directed, a diamond-cut thriller about a runaway train that won some of his best reviews." This may be the simplest story of them all: a train carrying toxic materials is loose on the track, there's no one aboard to stop it, and there's a hairpin turn (and certain derailment) in a highly populated area. Engineers Washington and Chris Pine have to get to that train and get it stopped. Period. Rosario Dawson plays the part Denzel played in Pelham, the train dispatcher coordinating everything from a distance. She also gets the best line of the movie, calling the runaway train "a missile the size of the Chrysler building." The final in a long line of thrilling Tony Scott action movies, Unstoppable may be the simplest, but it's also the most fun.